Ginger is a veritable storehouse of medicinal and culinary virtues, used in various cuisines worldwide. It is known as `Adrak' in Hindi. Today, ginger is popularly resorted to as a kitchen remedy to relieve common ailments. It is good for digestion, believed to prevent abdominal cramping, improve and stimulate circulation, used for relieving nausea, travel sickness, tooth ache, and believed to help in reducing levels of LDL (bad) cholesterol. Hot ginger drink with honey is excellent for cold, coughs and flu. It has a warming expectorant action on the lungs, dispelling mucus and phlegm. 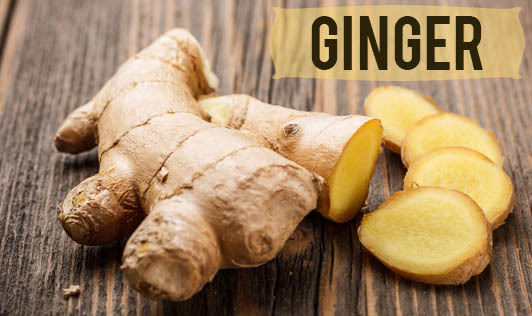 Like many spices, ginger has the quality of enhancing and complementing both sweet and savoury food. It is widely used for culinary purposes to season vegetable and meat dishes, in the production of ginger bread, biscuits, puddings, soups, pickles, ginger ale etc. Adding small amounts of ginger in daily cooking can go a long way in maintaining good health.